Cleans the engines oil ways, sump and components to flush out all the dirty oil and contaminants before new oil is added. Synthetic and semi synthetic oils are used in most of today's vehicle engines. These types of oil keep their viscosity for longer and helps to prevents "black sludge" building up. However, one apparent weakness of synthetic and semi synthetic oils is that they are not as soluble as the old mineral oil so it doesn't absorb the by-products of combustion (dirt and particles) as well. If these particles are left to build up they can start to clog oil ways, starving the engine of vital oil. This can lead to premature wear and failure. Active surfactants to thin the old oil; break down sludge and particle build up to ensure maximum drainage. A detergent to clean away residues, unclog oil ways and neutralize crankcase acids. 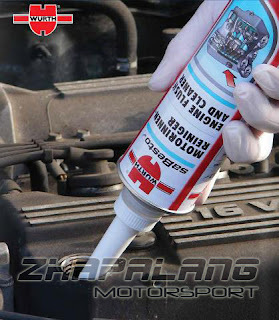 A lubricant, Organic Molybolan Compound, to protect the engine while the solvents and detergents are cleaning.